There are two main types of power tilt and trim motors and pumps that are designed for recreational boats that have an outboard or a stern drive. Older power tilt and trim systems use an electric tilt motor and a mechanical lifting device. On stern drives, the electric motor turns a worm gear and uses a wet clutch pack to tilt the drive unit and lock it into place. More modern boats, such as Johnson, Evinrude, Mercruiser and Volvo Penta stern drives, commonly use an electric / hydraulic power trim and tilt system. This arrangement consists of a 12-volt electric motor with a reservoir and a hydraulic pump or valve body. Problems with the hydraulic pump or valve body manifest themselves when the trim and tilt motor seems to be functioning properly, but the engine or drive unit won’t stay trimmed, or bleeds when in the upside down position. In this case, boaters are advised to replace their trim and tilt hydraulic pump and fill the reservoir with the proper power trim and tilt fluid. Captains are cautioned to not use transmission fluid, as the detergents in this solution can wear on the systems’ seals. Visit the Replacing Power Trim and Tilt Systems comprehensive article to aid in trouble shooting and the common problems with power tilt and trim systems. At the front line of the BP oil spill containment and clean-up, the primary soldier is the oil containment boom. There is some concern by some US lawmakers and local officials that that the booms aren’t working as intended along the US Gulf Coast. Oil containment booms are temporary floating barriers composed of plastic, fabric, and other buoyant materials. They may be held in place with drift anchors and have floats placed along their length to ensure that they are not accidentally broken up and sunk. The Coast Guard indicates that there are about 3.1 million feet of coastal protection boom available in the US, and about 430,000 feet of heavier-duty boom intended for use in open oceans as is reported to the Christian Science Monitor. Beyond the booms themselves, Taylor Made has come forward with low drag buoys being used in service as oil boom buoys. The primary function of these buoys is to mark the boom. Booms must be tended to make sure they don’t drift away from the spot they are supposed to protect. These oil boom buoys help keep the booms visible and keep a drift anchor afloat. A multi-million dollar vessel owned by the Tampa Bay Fire Department in Florida boasted its cutting-edge pumping technology on Wednesday morning, when it put out a major fire at the Port of Tampa. Early on June 16, several rubber conveyor belts at the port went up in flames, and the Patriot, the new fire boat, came to the rescue, myFox Tampa Bay reports. “With this vessel, the way that it’s built, its set up not only as a fire fight vessel but also as a command and control vessel,” Captain Bill Wade told the news source. 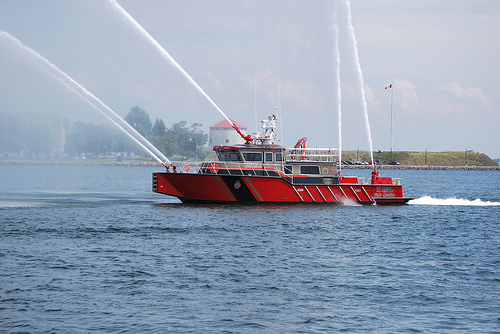 “[The firefighters] can control the situation from their side and make sure that fire crews are acting safely, because fighting a ship is much different than fighting a fire in a building.” Among its features, the Patriot can pump a total of 13,500 gallons of water per minute, which is the equivalent of nine fire trucks. While recreational boaters don’t need the high magnitude of pumping power required by the fire department, marine pumps nonetheless prove useful to all boat owners. 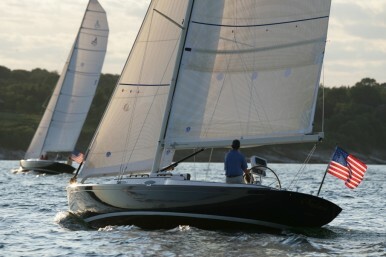 A modern 40’ vessel may have a dozen pumps or more, serving a myriad of functions aboard a modern yacht. An electric bilge pump can remove water that accumulates in a bilge at a rate of about 60 gallons or more per minute. Fuel transfer pumps are typically vane pumps that offer reversible operation. Engine driven pumps can serve for engine cooling, or exhaust cooling. Freshwater pumps can supply water to all the fixtures aboard, transfer water, be used in a bait-well or deck wash-down situation. Finally, macerator pumps and be used to grind waste from a marine toilet, eventually pumping out the slurry mixture when the boat is docked. As experienced captains know, the summertime boating season brings abundant opportunities to hit the open water, but can also bring scorching heat. In preparation, local officials of the Emergency Medical Services Authority (EMSA) are advising boaters on Oklahoma’s Keystone Lake to take steps to avoid heat-related illnesses. “We tend to make it a little more [clear] to our staff with heat related illness treatments [to] make sure we have plenty of ice packs [and] plenty of saline, which is what we provide a dehydrated patient,” EMSA assistant supervisor, Matt Cox, told Fox23.com. In general, the agency recommends common-sense tips to staying cool, such as finding shade and drinking water, as well as sunscreen and covering up. Jim Crutcher, one Keystone Lake boater, has taken the warnings to heart as he aims to combat the sun. “I wore my sunscreen thick…if you don’t see it it’s not enough,” he told the news source. To keep in the shade while boating, a Bimini top or an Anchorshade II erected over the boats occupants can supply much needed relief. The Anchorshade II by Taylor Made will supply a shade under its 8’ by 8’ single pole umbrella. Because of a fold down frame that supports the Bimini top, it has the advantage that the Bimini can be left up while the boat is underway at speeds below 20 knots. 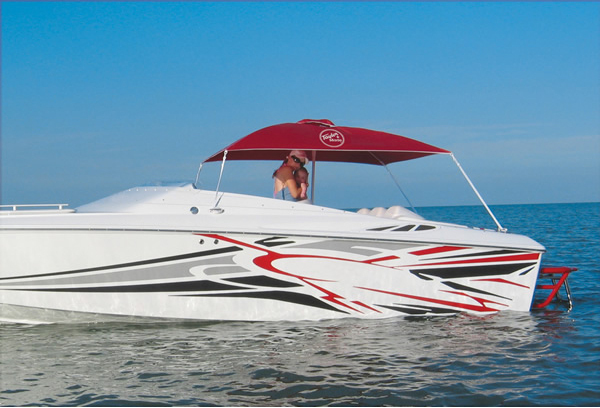 Both the Anchorshade II and the Bimini tops are stabilized with location straps included with each of them. Our Bimini top kits are so complete that all you add is a drill, screwdriver and easy assembly to install one on your boat. Stay protected from this summer sun this season while boating. A new Bimini or Anchorshade II will provide years of useful service, with quality materials and construction.